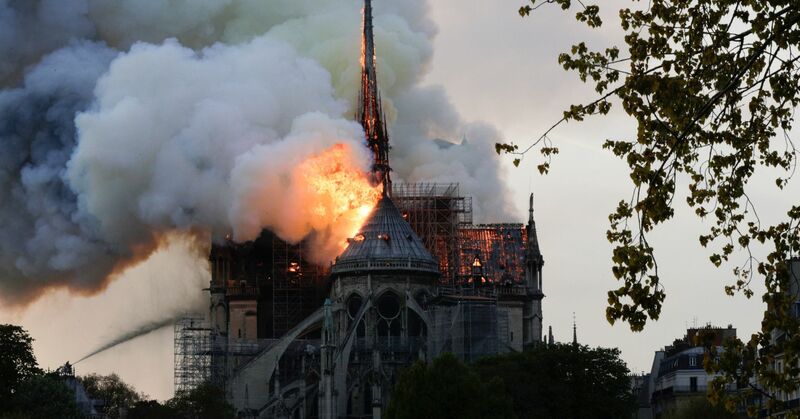 On April 15, a fire broke out at Notre-Dame in Paris, leading to the destruction of its roof and spire. Here we look back on the rich history and architectural details of the 12th-century Gothic cathedral, which has become a symbol of France. On April 15, flames swept through the ceiling of Notre-Dame and up its iconic spire as the world watched in horror. The medieval cathedral, which was under renovation at the time, has stood as symbol of Paris since its construction began almost a thousand years ago. 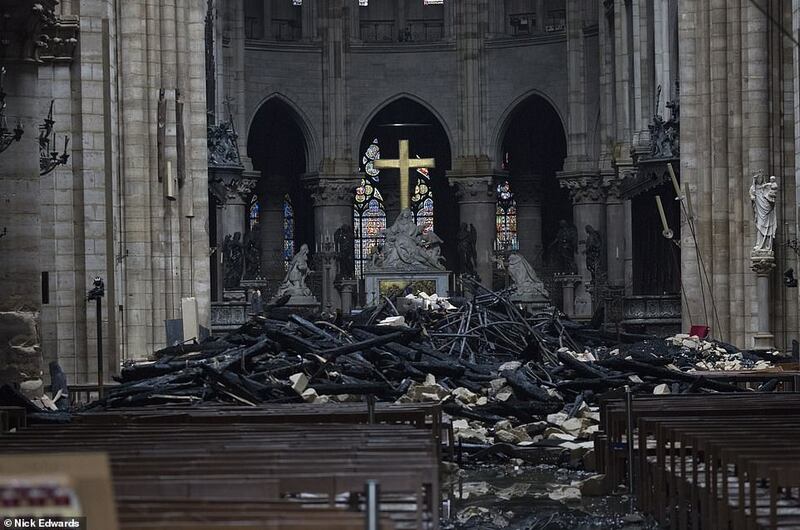 Fortunately, the structure miraculously survived complete damage and Emmanuel Macron, the president of France, has called for the rebuilding to be completed in five years. The construction of Notre-Dame de Paris began in the 1160s after Bishop Maurice de Sully demolished the former basilica on the site of the Île de Cité in Paris. King Louis VII, who was the French ruler of the time, wanted Paris' role as the political, economic and cultural capital of France to be reflected in the construction of several large monuments. As a result, Maurice de Sully began a much larger and higher cathedral on the site. The first stone was laid in 1163 in Pope Alexander III's presence. The building of the cathedral was an immense project that took 182 years to finish over four phases of construction. The first phase began with the high altar and choir, then the nave and aisles, followed by the transepts, flying buttresses and stained glass windows. Fires broke out in the 13th century, causing more renovations to take place, but by 1345, most of the major changes were complete. 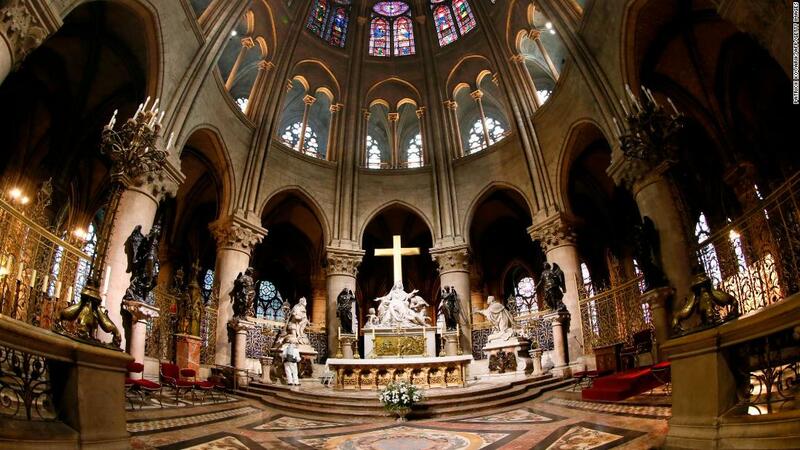 Notre-Dame is as a prime example of French gothic architecture. The vaults in the church room, the stained glass windows, and naturalistic elements along with sumptuous sculptural decorations contrast with the earlier, more simplistic Romanesque architecture. 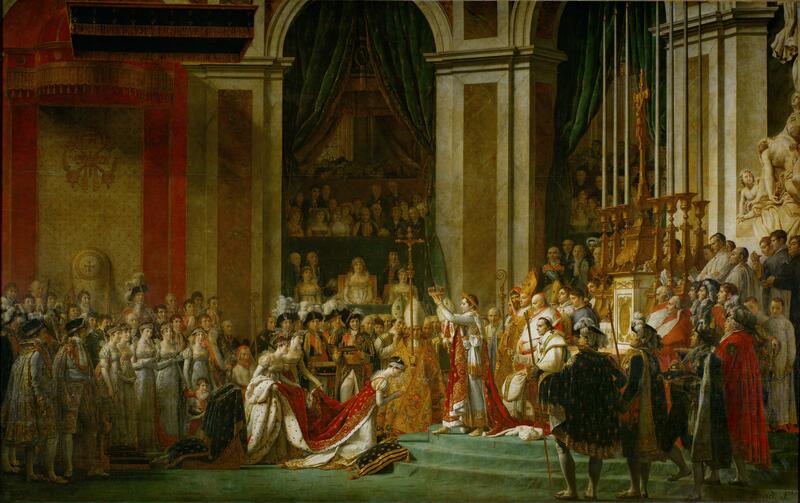 Jacques Louis David's famous painting of Napoleon's Coronation inside Notre-Dame, 1804. But the building has not always had the status associated with the stately cathedral today. During the French Revolution, the cathedral was vandalized and looted, and many of the objects representing religious imagery were damaged, destroyed or stolen. In 1793, Notre-Dame was dedicated to the Cult of Reason and then the Cult of Supreme Being, philosophical movements that sought to replace religion during the Revolution. The cathedral's 28 statues of Biblical kings, mistaken for French kings, were beheaded, and a representation of. 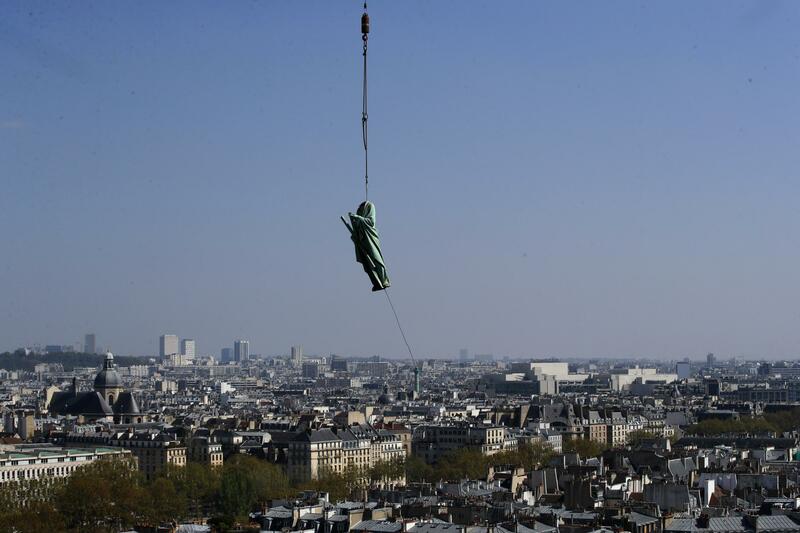 the Virgin Mary was replaced with the goddess of Liberty. By 1801, Napoleon Bonaparte returned the cathedral to the Catholic church and it was the site of his coronation as Emperor in 1804 and his wedding six years later. 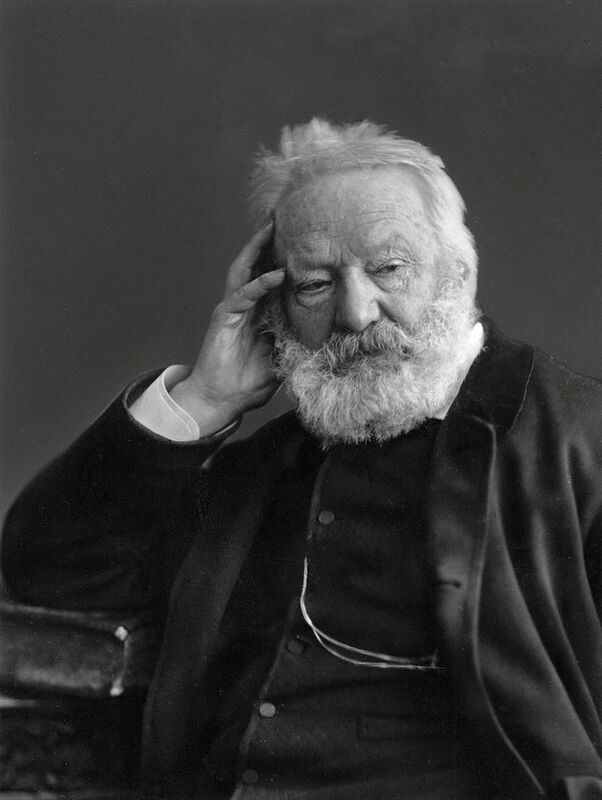 In 1831, Victor Hugo wrote the The Hunchback of Notre Dame, a novel about the humpbacked bellringer Quasimodo, who finds sanctuary in the cathedral's mysterious tower. The novel's mission was to draw attention to the importance of medieval and gothic architecture, especially the crumbling cathedral, which was on the decline. The novel was a success and revived public interest in the preservation of the cathedral. By the middle of the 19th century, an enormous renovation began under the helm of architects Jean-Baptiste-Antoine Lassus and Eugène Viollet-le-Duc, who returned the ancient structure to its Gothic glory. One of the most iconic parts of Notre-Dame is the wooden spire. The first spire was built in the 13th century, but was taken down in 1786 because of weather damage. During the major 19th century renovation, a new spire was made in oak and lead, weighing over 750 tons. Around the spire were copper statues of the twelve apostles, which looked out over Paris, except for St. Thomas, the saint of architecture, who faced the spire. Fortunately, these statues were taken down from the cathedral on Thursday for cleaning and survived the devastating fire. Iber pauperum is Latin for "the book of the poor" and is an expression for rich imagery used to teach the illiterate. 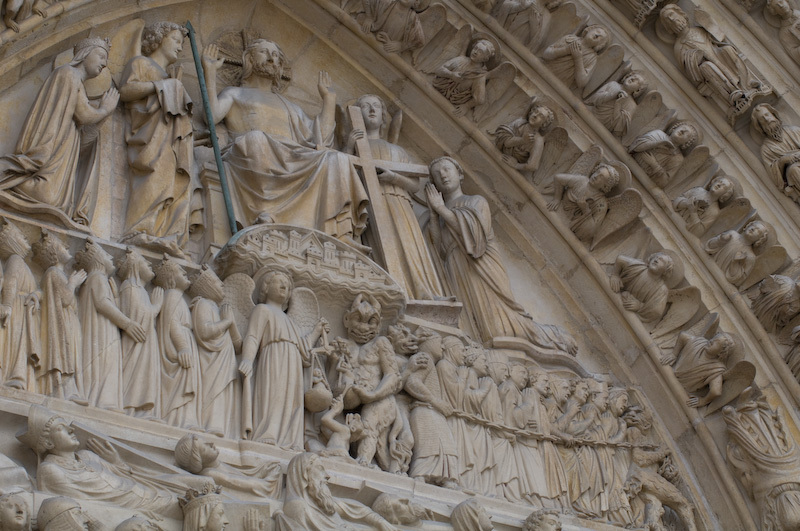 Notre-Dame is a so-called iber pauperum because the many sculptures would illustrate biblical stories for the widely illiterate Parisian population of the time. 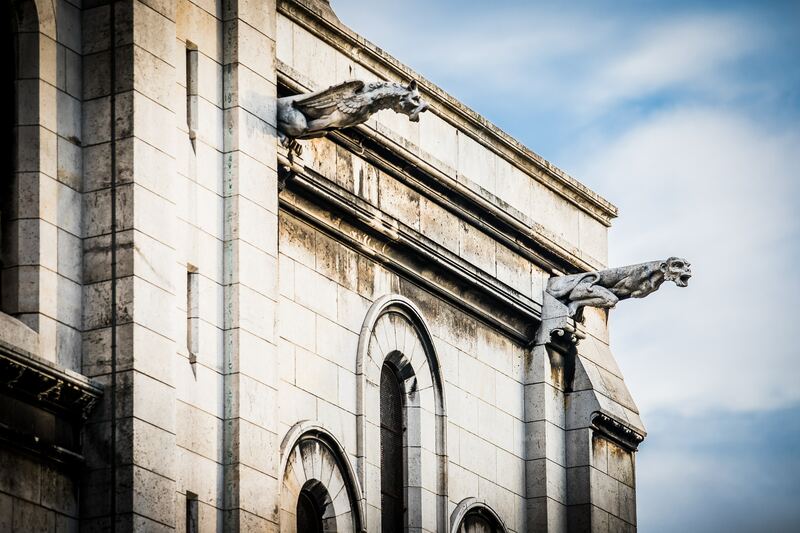 Over the main entrance on the western façade is a relief of the Day of Judgment, which depicts the sinners led down into hell and the good Christians ascending to heaven. But perhaps the most famous element of Notre-Dame are the imposing figures perched around the roof and tower of the church. The gothic monsters or grotesques are called gargoyles, such as Chimaira, a mythological hybrid with a lion's body and a goat's head, as well as Stryge, which is an owl or bat-like creature that is said to eat human flesh. The frightening figures were part of the message to the illiterate population, symbolizing the danger that threatened one who did not live according to the doctrine of the Church. But the gargoyles, which were added during the 13th century, also had a practical function. They acted as water conductors and ensured that rain water ran out through the mouths of the gargles, as far from the facade as possible. 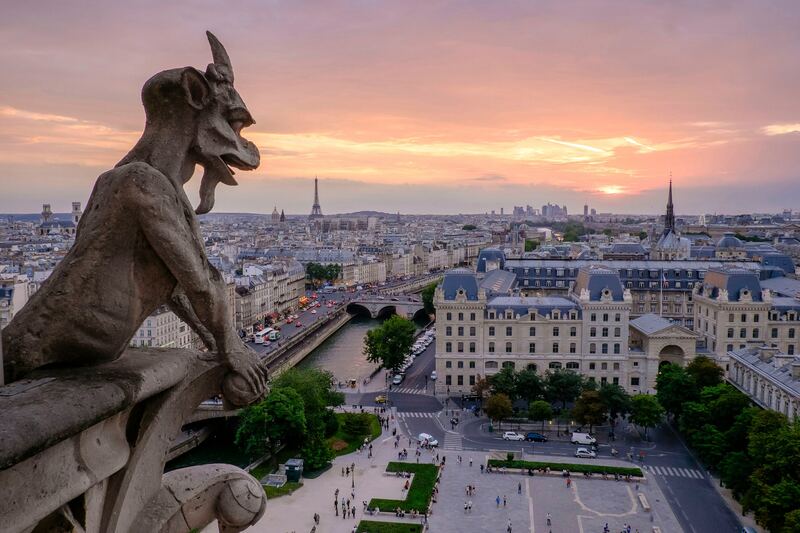 Several of the gargoyles, along with other sculptures, were taken from the cathedral during the 17th and 18th centuries or destroyed during the French Revolution. Under the leadership of Viollet-le-Duc during the 19th century renovation, they were replaced by Gothic figures, which in many cases were more Gothic-inspired than the original ones. The sculptural decoration of the cathedral also contains motifs and symbols from medieval science and philosophy. 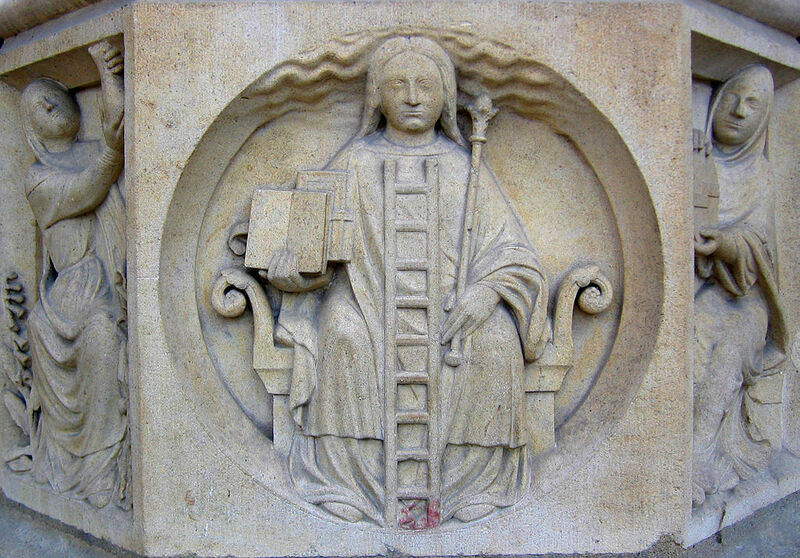 On the pillar of the main portal is a woman sitting in a throne, with a spire in her left hand and two books in her right. One book is open and symbolizes general knowledge while the other is closed and symbolizes esoteric knowledge. There is also a ladder with seven steps, a visual metaphor for the seven steps alchemists followed in their scientific search for turning base metals into gold. 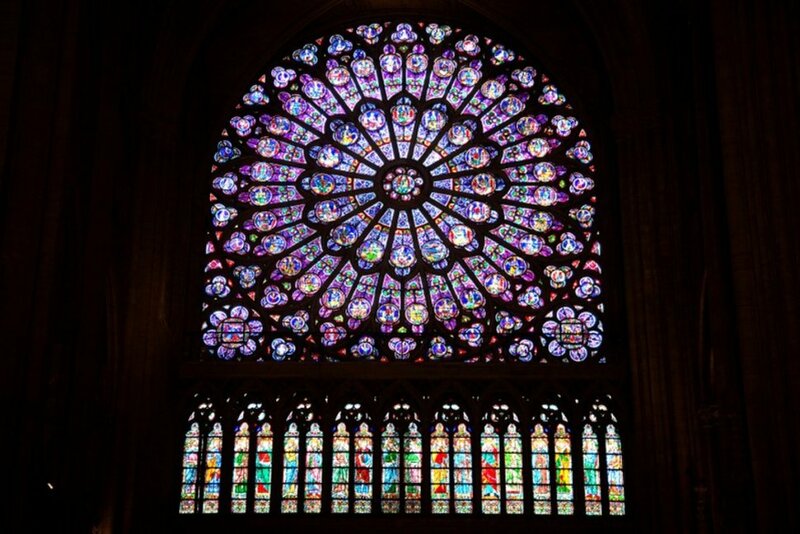 In addition to the gargoyles, the stained glass, especially the rosette windows, are some of the most famous decorations in the cathedral. The first, and the smallest (31 feet in diameter) came in place in 1225, that on the north side 1250 and the south around 1260. The southern window still has glass sections from the 13th century. Fortunately, all three of the famous windows survived the flames. Another famous part of the church that survived are the musical instruments, such as the organ and bells, particularly the Emmanuel bell. 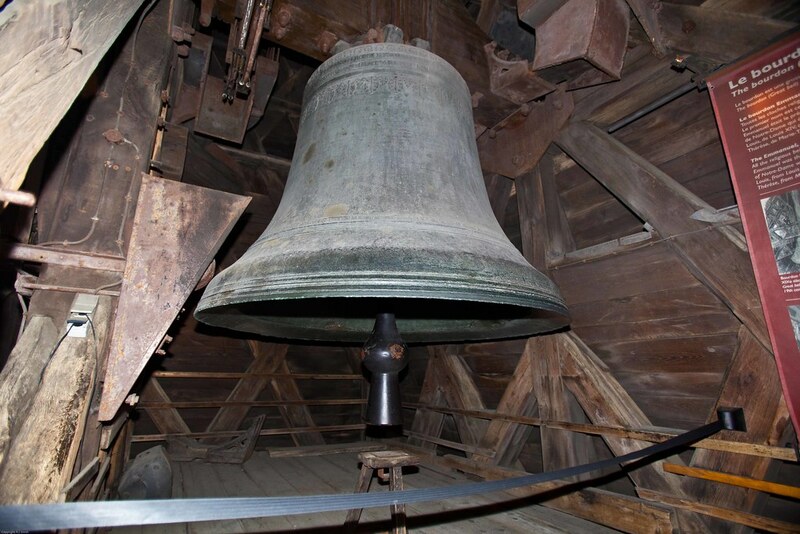 In 1681, the church's main bell was recast based on a 15th century model by King Louis XIV. It has rung since then for religious holidays and the most important moments in French, and world, history including coronations, pope visits, the end of World Wars I and II, and on September 11, 2001. The grand pipe organ of Notre-Dame, finished in 1868, is one of the most important organs in the city and continues to stand after 150 years, though the state of its musicality has not been assessed yet. The fire that broke out on Monday night is thought to have been caused by the renovation that was in process and wooden beams from the 12th century may have been why the fire spread to the extent it did. Of course, during the rescue work the focus was on stopping the fire, but also a great effort was made to save as much art as possible. Anne Hidalgo, the mayor of Paris tweeted an image of objects rescued in the fire and thanked the police, fire brigade and others involved for forming a human chain to save the objects. 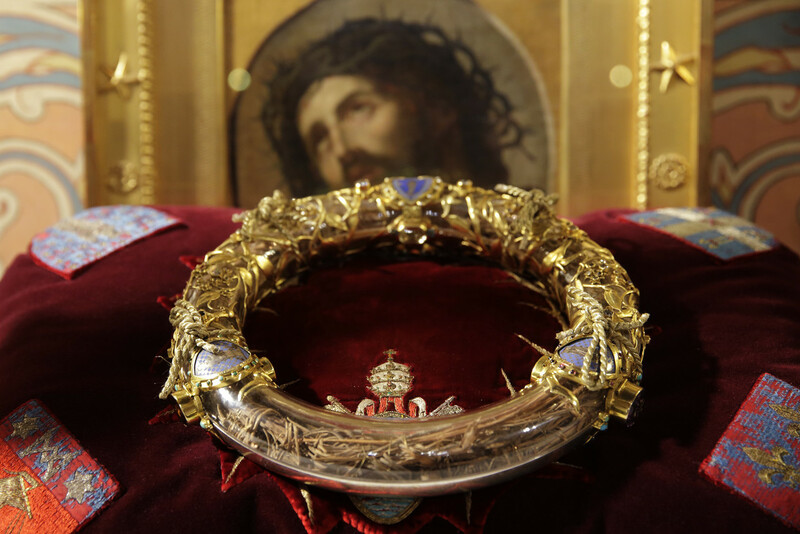 The cathedral's most valuable items, such as the crown believed to have been worn by Jesus at his crucifixion, the tunic of St Louis and relics from the patron saints of Paris, as well as chalices and paintings, were saved. 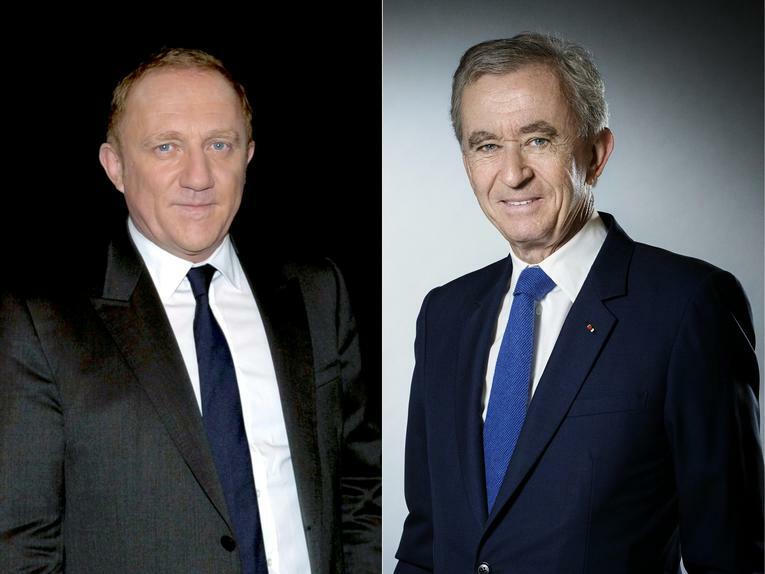 President Emmanuel Macron has promised that the cathedral will be rebuilt within five years and the top French billionaires immediately pledged their support with François-Henri Pinault, heir to the luxury group Kering with fashion brands like Gucci and Yves Saint Laurent, and Bernard Arnault, who founded LVMH of Louis Vuitton and Moët & Chandon, donating 100 million euros and 200 million euros respectively. Currently, total donations stand at almost $1 billion for the rebuilding of Notre-Dame. 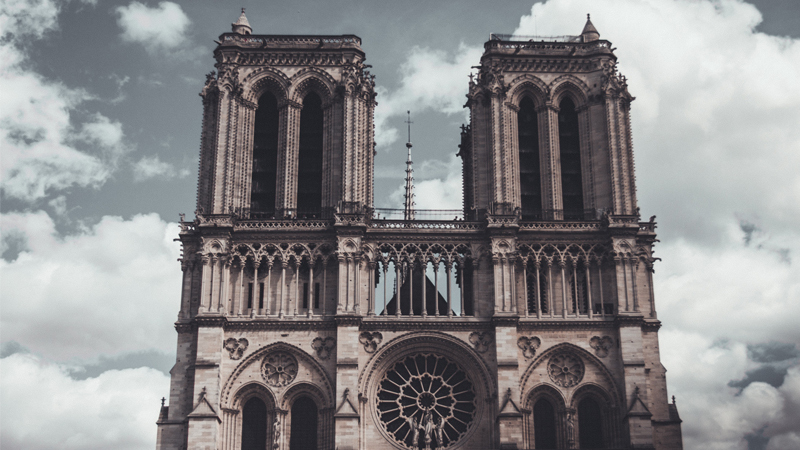 The cathedral has been classified as a UNESCO World Heritage Site and is a symbol of France with its outstanding history, cultural value and extraordinary architecture. 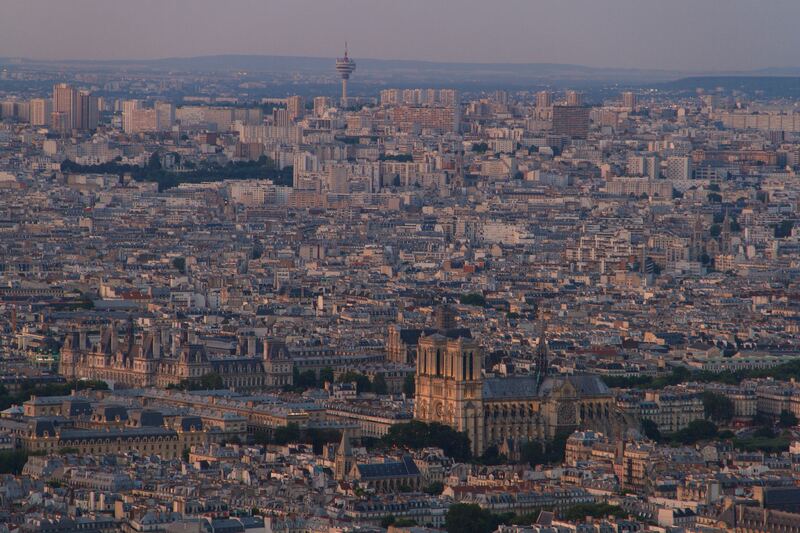 About 12 million people visit the cathedral each year, Paris's most visited monument. While the cathedral's spire and ceiling suffered, the rest of the cathedral survived remarkably in tact. Although a long rebuilding process lies ahead, the magnificent cathedral, which has stood strong in the midst of the French Revolution, the liberation of Paris during World War II and the recent flames, as well as a millennium of weather, will continue as an icon of France for centuries to come.